Northwest Boise real estate extends from the lush Boise River and Greenbelt all the way out into the dusty-boot brown Boise foothills. The area is a mix of old and new, near and far, and makes every part of the Treasure Valley accessible. State Street connects those in northwest Boise to Downtown and more rural areas to the west. Slithering along the base of the foothills is Hill Road, which provides a winding, undulating route toward Downtown, Bogus Basin ski area or Eagle. Boiseans love to be outdoors, and northwest Boise real estate provides the best of both worlds between the foothills and Boise River. Finding a trail to walk in the foothills or a place to stick your feet in the river is never far away. An astounding view over the Boise area or the cold river water stinging an inquisitive toe can both take your breath away. The eastern edge of northwest Boise initiates the gradual transition of older homes for sale and neighborhoods to the newer subdivisions on the western side. NW Boise real estate offers a natural and diverse blend of classical and developing areas, from the homes near 36th Street with a North End feel to the secluded community of Hidden Springs amongst the foothills. After climbing Mount Ventoux in France, Petrarch wrote "My only motive was the wish to see what so great an elevation had to offer." Sure, the Boise foothills aren't the Alps, but the same principle applies to their allure. The sloping walls of the Treasure Valley reward those willing to ascend (and maybe pop their ears) with magnificent views of the Boise area and opportunities to experience the outdoors. Gazing out over the numerous ridges and valleys makes it easy to get lost in a sublime thought. About 130 miles of trails, tailor-made for a morning jog, walking the dog or seeing wildlife, meander up and around the hills bordering the northern side of the city. That trail network includes Seaman's Gulch Trail and Big Springs Trailhead in northwest Boise. It's easy to forget that Boise is considered part of a desert, but walking amongst the sage scattered throughout the foothills presents a stark contrast to the green, live river not far away. The foothills are home to many native plants, so keep an eye out for the pink flowers of the taper-tip onion or Idaho's state flower, the syringa. 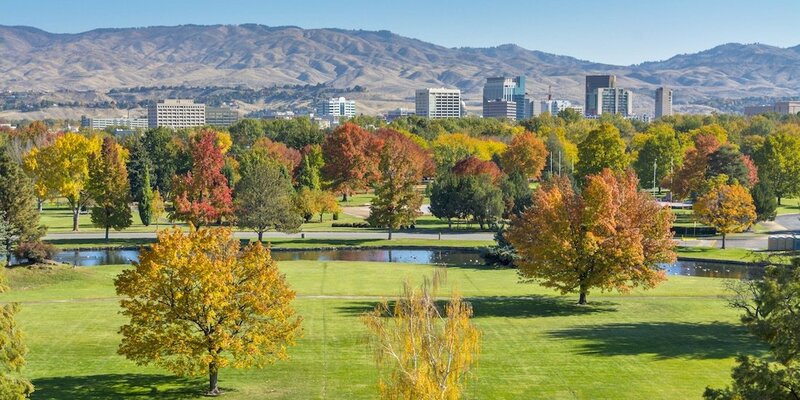 Although Boise is the City of Trees, the town's pulse is kept by the Boise River. Boiseans and trees alike are drawn to the shores of the river for life and the natural calming effect water provides. For people in the northwest Boise, that may involve fishing for trout, strolling or riding a bike down the Greenbelt's path, or simply watching the freshwater ripple and flow right on by. Depending on the season, the river either trundles or roars from the east side of town to the west. Trees crowd their way down into the river, bustling each other to get their roots near water. Those victorious ones, many of which are cottonwoods, contentedly hang their limbs high above the stream. In fall, the orange and yellow hues of their leaves contrast astoundingly with the inky blackish-blue river beneath. Even in winter, when the leaves have shivered away and shy sandbars are revealed by retreating water, a bundled-up Boisean can still enjoy a walk near the river. Mature maples and cottonwoods line the fairways here in northwest Boise at one of Boise's oldest and most enjoyable courses just off State Street. This private course is next to the Boise River, and on a hot summer day, a cool breeze off the river on No. 5's green might refresh you enough to knock your putt in. Plantation's terrain is flat, and at just over 6,300 yards from the back tees, extremely walker-friendly. Tall trees, numerous sand traps and small greens reward proper ball placement, and once you're putting, there may not be a truer roll in the Treasure Valley than here in northwest Boise. Creeks and ponds come into play on a few holes, but the more appealing water is in the country club's pool, just outside the restaurant and near three tennis courts. A two-out rally on a hot summer evening rolls on as the pitcher steps off the rubber, takes his cap off and wipes the sweat from his forehead. With the go-ahead run on third base, a burly slugger lumbers from the dugout to the plate, takes a couple practice cuts, stares directly at the pitcher, then digs his back foot into the batter's box. The sweaty palms of spectators grasp the chain-link fence surrounding the diamond, eagerly awaiting resolution. OK, so maybe not every recreational softball game at Willow Lane ends this way. But for some, this is their Fenway Park, Wrigley Field or Yankee Stadium located in northwest Boise. You don't need to be a gung-ho softball player to enjoy Willow Lane, because there are plenty of options and space around to do what you want. The 57-acre athletic complex contains six softball fields, a playground, two tennis courts, a basketball court and a soccer field right next to the Boise Greenbelt. Velodrome North of State Street on Horseshoe Bend Road, mountain bike trails weave and rattle their way through brush on the slopes of the NW Boise foothills. The expansive area also features BMX tracks that bump, jump and carve through the terrain.